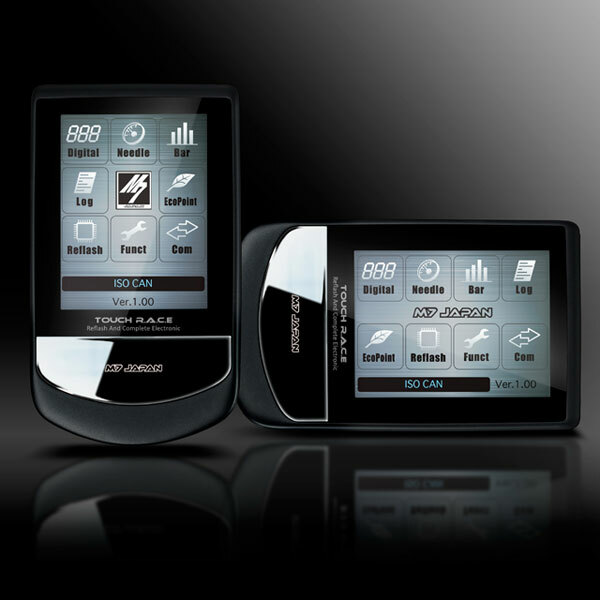 The next generation of OBD communication device equipped with 3.5 inch TFT liquid crystal/touch panel function. Touch RACE is the adaptions of touch screen panel and advanced graphic displaying vehicle complete electronic data with re-flash capability. Equipped with 3.5 inch TFT Liquid crystal / Touch panel function came with logging capability. All information on the vehicle can be monitor by connecting it to the vehicle OBD. The Touch RACE also came with advanced 3D graphic design display similar to a racing car instrument that can show up to 50 types of displays. In addition, special holder or bracket came standard with the equipment and can be adjusted in a multi angle display. The SD card slot and USB port also came standard with the product. The speed limiter cut as optional feature can rewrite the ECU data through OBD (available for certain car models). The running data was installed and the data logger function was able to be log using personal computer by connecting through USB. It will correspond to the future upgrade by downloading data from our WEB site. External input data can be displayed by adding connecting sensor with an optional sensor junction box.